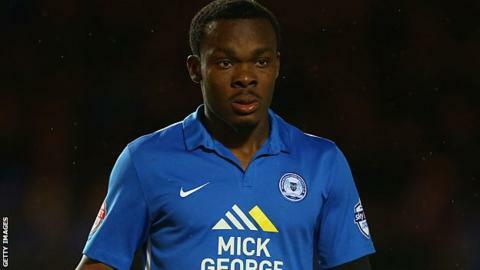 Newport County have signed Peterborough United forward Souleymane Coulibaly on loan until the end of the season. The 21-year-old former Tottenham Hotspur youth player has scored six goals in 32 appearances in all competitions this season for the Posh. However, Newport do not expect international clearance for Coulibaly before their Easter weekend games. "It's very frustrating, as today is a working day for everyone," said Newport manager Warren Feeney. "It will be disappointing after doing the hard graft to get the player signed that he is likely to miss the first two games." Newport travel to leaders Northampton on Friday and host Accrington Stanley on Monday. A Newport statement read: "Unfortunately following confirmation that the Fifa offices closed at 11:00 GMT on Thursday morning, it is unlikely the club will be able to gain international clearance for the player until Tuesday 29, March 2016 at the earliest. "Both the FA (Football Association) and FAW (Football Association of Wales) are assisting us in trying to contact Fifa out of hours. "The club will be disappointed if Souleymane is unable to feature in our Easter games due to the holiday season in Switzerland.